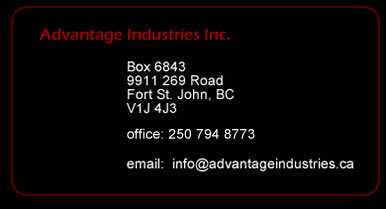 Advantage Industries Inc. is an oilfield construction and maintenance company that services North Eastern British Columbia and Alberta. From concept to reality, Advantage Industries Inc. can execute your entire project, complete simple modifications, environmental clean-ups, small or large pipeline projects, tank farms, gathering systems or gas plants. Advantage's associates demonstrate the competitive business intelligence and intellectual capital needed for our clients to succeed. © 2009 Advantage Industries Inc.